Six months ago I put up a post looking back at the performance of my app, Story Tracker, over its first six months on the App Store. 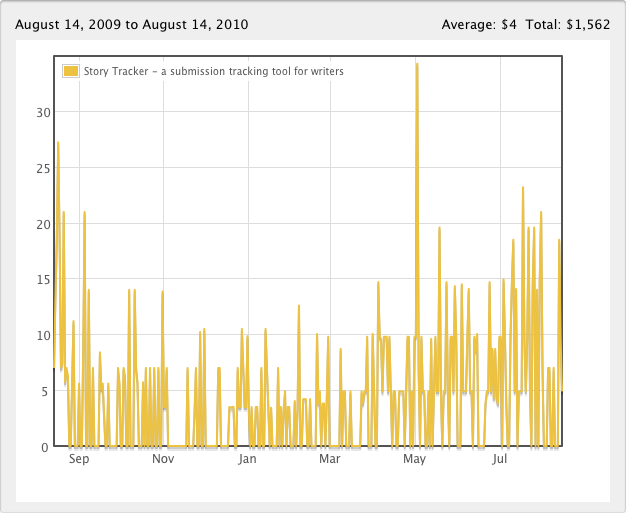 Story Tracker is a submission tracking tool for writers, available in both paid and Lite versions. If you missed the post back then, you might like to take a look. It’s full of gory details, including a fair amount of depth about my promotion and marketing efforts. As you can see, there were some interesting things going on over the past six months, but we’ll take a closer look at those in a moment. 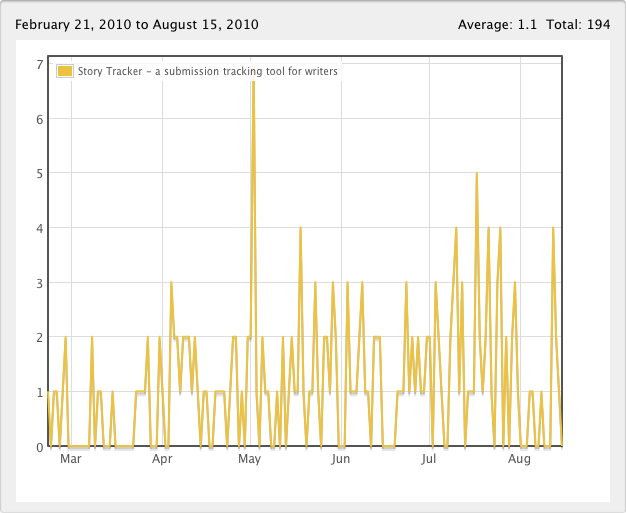 During its first year, Story Tracker made $1562 with 331 sales. At the time of my previous post it was looking like sales would steadily decline to nothing, although I still held out hope that I could reverse the trend. Flash forward six months and we see that I did manage to pull a small rabbit out of my hat, with sales actually increasing to an overall average of $4 a day versus the $3 a day I was making before. Not a huge jump, but you can clearly see the upward trend on the revenue graph above. Story Tracker Lite sold a total of 3174 copies, which will probably roll over to 3200 to close out its first year. You can’t beat free! You’ll note the spike on this graph is even more pronounced. Unless you’ve been living in a cave over the past six months, you can probably guess what happened then! 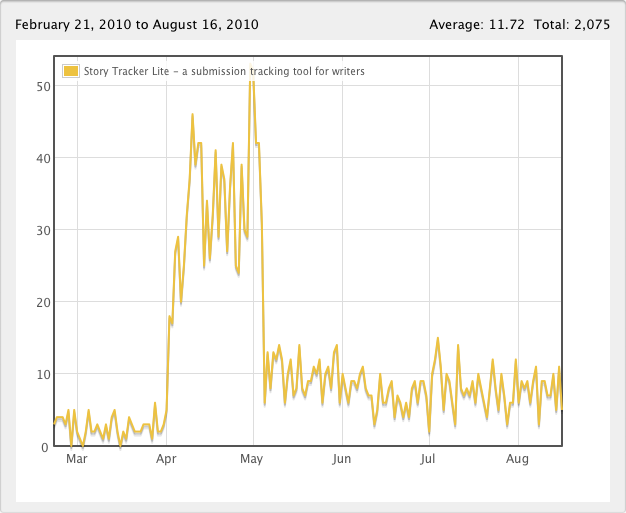 In the closing paragraphs of my six months post I mentioned I had begun working on the iPad version of Story Tracker. Well, naturally I left it to the last minute and didn’t do any substantial work on the iPad update until just over a week before the iPad launch date in the US on April 3, 2010. After burning the midnight oil, I was able to complete the update in time and the Universal version 1.5 of Story Tracker hit the App Store with days to spare. For awhile there I didn’t think I’d make it in time due to a baffling rotation bug I wasn’t able to figure out until I’d had a decent night’s rest. Sales since the launch of the Wi-Fi iPad have been markedly higher than they were at the beginning of the year, and have only now just begun to taper off. The graph shows a decent sales spike around May 2nd, with further peaks on May 18th, July 17th and elsewhere. The May 2nd spike can be attributed directly to the launch of the iPad 3G on April 30th in the US. In comparison, the iPhone 4 launch on June 24th barely registers, although it has probably helped maintain sales volume since then. Downloads shot above the noise soon after the launch, peaking at 46 downloads on April 10th. A second peak followed on April 30th (iPad 3G launch day) with 53 downloads. During this time Story Tracker Lite was in the Free iPad Productivity app charts, reaching #24 on April 9th. Even after it dropped out of the charts, the average daily sales volume is still higher than it was before the iPad arrived on the scene. Over the past six months I’ve released two updates to Story Tracker. The first I’ve already mentioned above. The second and most recent update landed on June 27th, and it includes quite possibly the most requested feature since the app launched last August: the ability to export and import CSV files for use with desktop spreadsheet applications like Excel or Numbers. This is a handy addition to the database transfer over WiFi feature, finally allowing writers to unlock all the story, market and submission data they’ve accumulated on their devices. Since I started working on the update after the iPhone 4 and iOS4 announcements, this update also includes support for iOS4 multitasking and a high-res icon for the Retina display. All of the text and the built-in web browser appears much sharper on the iPhone 4, with no additional effort required on my part. By popular demand I added a new Downloads section to my site, which includes downloadable Story Tracker market databases. These can be imported into the Story Tracker database on your device. This should save some typing. As of this post I have databases of professional science fiction and fantasy markets available. The most recent update was approved the day after the iPhone 4 launch. While I didn’t notice any substantial sales spike, I do think it adds a lot of value to the app and helps maintain sales volume. I covered my various marketing efforts fairly extensively in my earlier post, so I won’t rehash them again here. However, I do have a few updates and observations from the past six months. 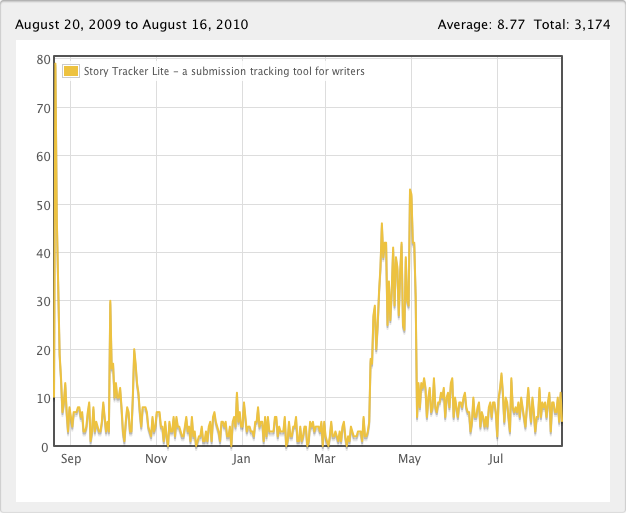 My marketing for Story Tracker hasn’t changed much. I’ve continued to post news about updates to my blog, Twitter, the Facebook fan page, and various online writing forums. I haven’t revisited my paid advertising experiment and don’t plan to. It simply isn’t cost effective for a low revenue niche app like mine. There is one highlight on the promotional front, though – the first Story Tracker review on an app review site! 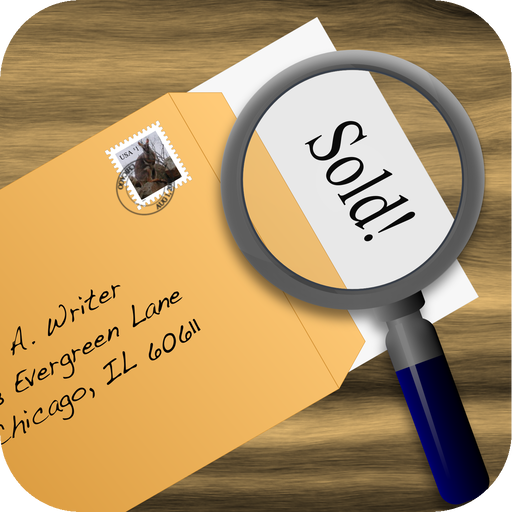 On July 21st, app advice published a short review in their round-up of useful apps for writers. I was pleased to see it, considering the general dearth of Story Tracker reviews outside the App Store. Earlier in the year while investigating other marketing avenues, I came across Linkshare. Seasoned developers are probably nodding their heads at this point. Linkshare allows you to earn affiliate income as a percentage of sales made through iTunes. Whenever a link containing your affiliate code is clicked, 5% of the dollar amount of any purchases the user makes over a certain period (a few days, I think) on iTunes are credited to your account. This doesn’t just include apps, but also anything else available through iTunes, including iBooks, movies, and music. I’ve made less than $10 through affiliate links so far this year, but I’ve heard some app developers make a decent side income from Linkshare. If you’re a developer who hasn’t yet updated links to your app via Linkshare, you’re leaving money on the table! With the greater feature set in the past few updates, I was able to increase the price of the app without adversely affecting sales. Sales had dropped off a cliff last November, forcing me to lower the price substantially and making me question whether it was still worthwhile continuing development on the app. I’m glad I persisted! After several pricing changes, I’ve come to the conclusion that $6.99 is a fair price for Story Tracker. As you’ll see in a moment, there are some caveats. While the numbers show Story Tracker has made over $1500 so far, I’ve actually only seen about half that. Overseas sales make up a non-trivial percentage of the total, and since none of the regions outside the US has sales exceeding $150 yet (the minimum to trigger payment for a region), I imagine it’ll be quite awhile before those funds arrive. This has been an expensive year for app developers, at least as far as Apple product launches are concerned. Not only did they refresh their iPhone line with the iPhone 4, but they also unleashed the iPad on a mostly unsuspecting public. They also released iOS 4 which addressed many of the past criticisms of the platform. All of which means developers need to purchase more test devices to ensure their apps work well on the new platforms. I’d already budgeted for a new iPhone, since my 2-year AT&T contract was due to expire this year and I’d again become eligible for a subsidized phone. What I hadn’t counted on was the iPad! Initially I’d planned to hold off on buying one until next year, but with finances looking up this year and my Twitter feed full of gushing praise for the device, I caved in over the iPad 3G launch weekend. And then I had to order one online and wait two weeks due to shortages. After that I’d learned my lesson and pre-ordered the iPhone 4 the day they went on sale. With the above purchases and the addition of an iPod touch 3rd gen included (to test iOS4 before the iPhone 4 release), total expenses for development of Story Tracker come to around $4600 so far. While I did pretty much everything myself, I’m still a long way from break-even. Having said that, these costs can be amortized over multiple apps, and it should be possible to recoup them within another year or so. I didn’t track development time precisely, but I estimate the total at around 500 hours to develop the initial version and the subsequent six updates. Developing apps is certainly more time consuming than it may appear, but it sure beats sitting on the couch and watching Lost! In my six month post I mentioned that while Story Tracker was not a financial success, it still succeeded from the standpoint of learning how to develop an iPhone app from scratch and launch it on the App Store. I think that’s still the case! I’ve put Story Tracker development on the back burner for now, while I work on my next app. It’s not a game as I’d originally intended, but instead another productivity app. This time my focus is on artists and art collectors. There are a few hints about this new app in my previous post Attention, Artists!, but if you’d like to learn more, you might want to subscribe to my app newsletter. The newsletter form can be found in my previous post, or on the Contact section of my site. Stay tuned! I’m hoping for a relatively short development cycle of a few months, although it’s possible the app won’t be ready for release until later this year. We’ll see how I go. Rather than keep everyone in the dark about my new app until the day of release, I’ve decided to provide a proverbial ‘peek behind the curtain’ to whoever is interested. This will take the form of an email newsletter: the AndrewNicolle.com Apps Newsletter. Subscribers to the newsletter will be the first to see screenshots and other details about the new app, along with news about updates to my existing app, Story Tracker, and other new apps in development. Newsletter updates should be fairly infrequent, so there’s no need to worry about your Inbox being flooded with app news! So if you’re a working artist, a collector of art, a Story Tracker user, or just plain curious, you can subscribe to my newsletter by filling out the following form. After clicking the Subscribe button you’ll receive an email requesting confirmation, to ensure you really did mean to subscribe. Please Note: I won’t give away or sell your email address to anyone. Your email address will be used only for my app newsletter. You can unsubscribe from the newsletter at any time. To unsubscribe from the mailing list, click here. Both the newsletter sign-up form and the unsubscribe link can also be found on the Contact page on my site. I’m excited about working on this new app and providing a productivity tool that I genuinely believe will be useful for artists and art collectors alike. I look forward to keeping you updated as development progresses! Tonight I started some preliminary design work for app #2, which will be another productivity app. What little game development I’ve done so far this year is now on hold. I’ve been so busy lately with work and vacations that I haven’t had much of a chance to do any iPhone work, other than Story Tracker.